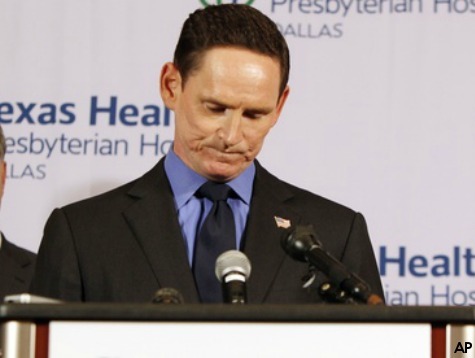 HOUSTON, Texas — Dallas County Judge Clay Jenkins has seized nearly every opportunity to place himself on a national stage amid the Ebola crisis in Texas. By doing so, he has transformed from a local authority to a well-known public figure. Most recently, Jenkins said that 43 people who were quarantined for 21 days and have now been released — all of whom had come in contact with Thomas Eric Duncan — posed “no risk” to the greater public. Despite Jenkins’ conviction, the World Health Organization found that two percent of Ebola cases have an incubation period of more than 42 days — more than double the amount of time that Duncan’s contacts have been quarantined. Regardless, Jenkins stated that the exposed individuals would be “integrated” back into Dallas. It is easy for one to question Jenkin’s boldness. The Ebola crisis in Dallas has elevated Jenkins to a national platform in a very short amount of time. Since Duncan was diagnosed with the deadly disease, Jenkins has found himself in the spotlight repeatedly, and the mainstream media has wholly embraced him. The judge made headlines across the nation when he entered Duncan’s apartment, where soiled lines abound, with no protective gear on. Duncan’s family was quarantined in the apartment at the time, sleeping on the same mattresses that the Ebola patient had been sleeping on. Jenkins proceeded to attend a press conference later that evening, bragging to reporters that he was “wearing the same shirt” he wore while he was in the apartment. The mainstream media predictably went wild over Jenkins’ efforts to personalize the deadly virus, thus downplaying the potential for a real outbreak. Jenkins’ transformation into the media’s darling has been eerily similar to State Senator Wendy Davis’ rise to fame following her 11-hour abortion filibuster.